Amy's Creative Pursuits: Fashion Over Fifty: Wearing My Stitch Fix Clothes & A New Winter Coat! 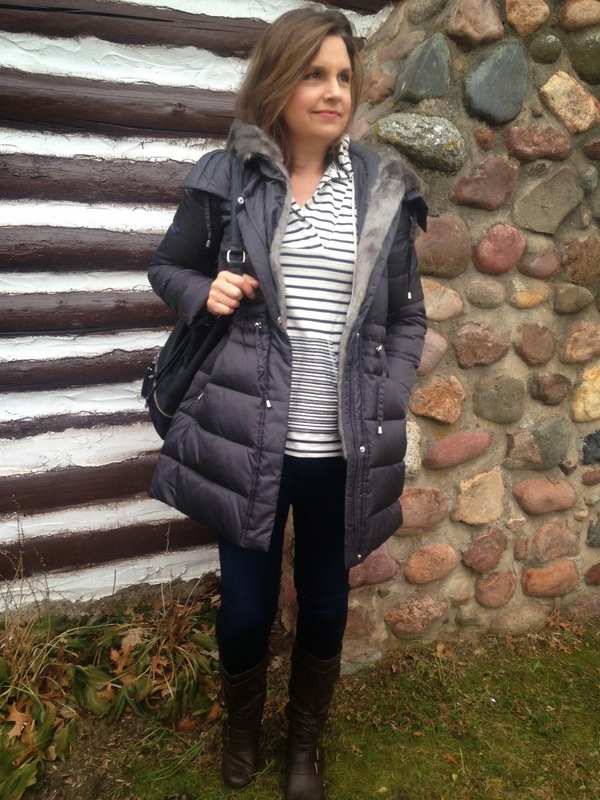 Fashion Over Fifty: Wearing My Stitch Fix Clothes & A New Winter Coat! Hello! Remember THIS POST where I showed you 'selfies' of me in my new Stitch Fix clothes? Well here I am actually wearing them! 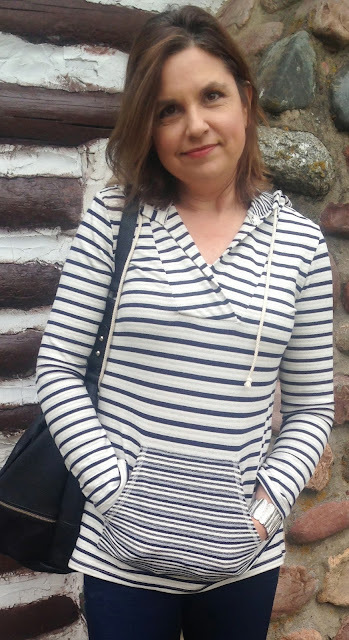 In the picture below I am wearing the La Made Redhouse Striped Hooded Sweatshirt and the Kut From The Kloth Denna Dark Wash Skinny Jean. I followed the Stitch Fix Style Card, and wore the top with tall brown boots and a white tank underneath. My bucket bag is from Express. Last winter was so miserably, brutal cold that I swore if I survived it, I would buy a new coat and boots that could withstand below zero temperatures. 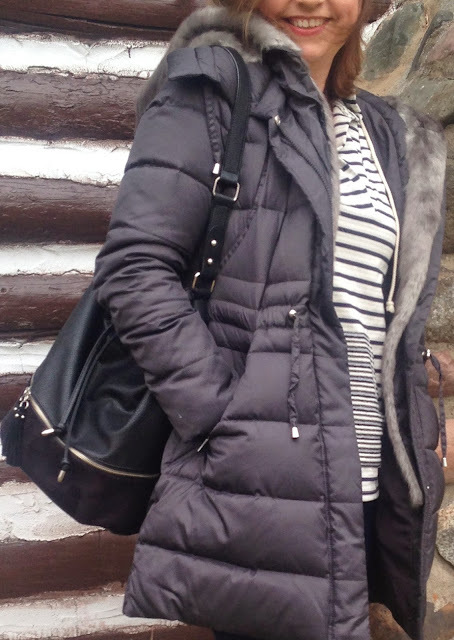 Although I already own a short down-filled coat that is very warm, it stopped right at the waist and I really wanted a longer one to help keep my legs warmer. I found this beautiful down-filled grey coat at Macy's (not available on-line). It's regular price is $375.00 and I got it on a special one day sale for $137.00. In hindsight, I wish I would have taken pictures with the coat zipped, but I was more concerned with photos of the clothes underneath at the time, and didn't think about it. I'm sure as long as our winters in Wisconsin last, there will be many more opportunities to show you my new coat. Anyway, since our temperatures have already plummeted to 20 degrees or less, and we already had our first snowstorm, I've had plenty of time to put my new boots (not shown in this post) and new coat to the test. I have found that my new coat is very warm, and I have not been cold one bit from the waist up, HOWEVER, as much as I love it, my legs are still cold and I wish I would have gotten a longer one. I was thinking about it, and I even tried one on (they make some that go all the way down to the top of your boots or ankles!) but then I thought it might be too much and restrict mobility. And I really didn't like the way I looked in them either. I don't regret buying this coat, I'm sure I'll get a lot of use out of it, but I would like a longer one too for those really frigid days. Now my boots, on the other hand, are excellent! They are waterproof, and keep your feet warm to 40 degrees below zero. I wore them feeding my birds, taking out garbage at work, and walking through tons of snow, and my feet stayed toasty warm and dry. So, I'm really happy with those. I wasn't wearing them the day these pictures were taken because the snowstorm occurred the day after we took these pictures, but I'll be sure to feature them in a future post. In the meantime, you can see them HERE. I really loved the color of this coat. I was going to get a black one, but this shade of grey is so much elegant and not as harsh as black. I also really liked the fur trim. Most of the other coats I looked at had a shaggy fur trim, and it was only around the hood. This fur is so soft and pretty and I like the way it goes all the way down the front of the coat. Another added feature is the pull strings around the waist. I always hate how much fatter I look in winter than I do in the warmer months because of all the layers I have to wear to keep warm. I want to wear a sign around my neck that reads, 'No, I'm not this heavy. I just have four or five layers of clothes on to keep warm!' Unlike most people who try to lose weight in the spring so they look good in a bathing suit come summer, I try to lose weight in the fall so I won't look bigger than I am under all the bulky sweaters and layers of clothes! It was bitter cold when we were taking these pictures and my husband kept saying to me 'Smile. Pretend your happy and not freezing!' And then I would burst out laughing and he would capture the moment on film. Because we were hurrying our fashion shoot, I didn't notice my hood was all scrunched in back. But I used this photo anyway, so you could see the cute hoodie and the back of the top. 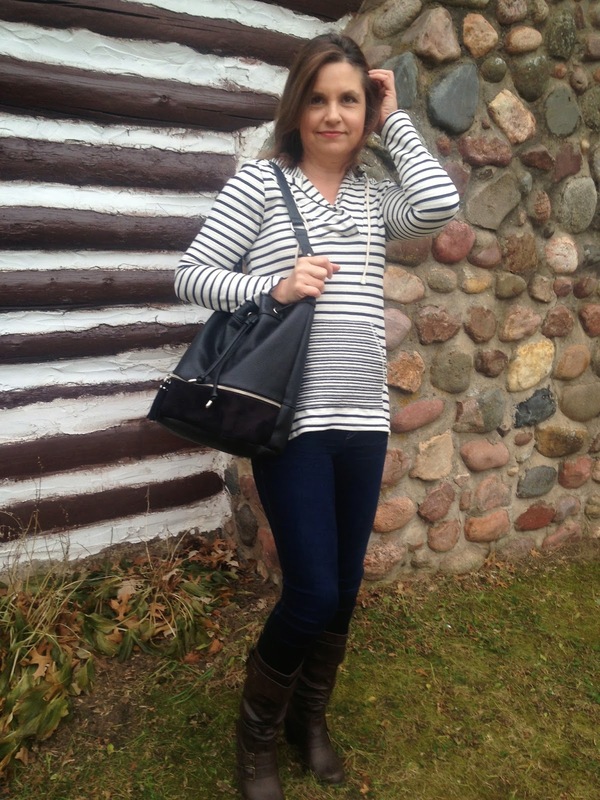 The black bucket bag (or luggage as my husband likes to call it) I've shown to you before. It's so big, if you put something inside, you may never find it again. But I'm away from home more than I'm at home, so I need a big bag to carry my life in. I always love any clothing items with pockets, and I especially love the front pocket of this top. It really is the perfect casual top: comfortable, trendy, and nice and long so I can wear it with skinny jeans and not feel self conscious. The only jewelry I wore was a silver feather cuff from Old Navy. 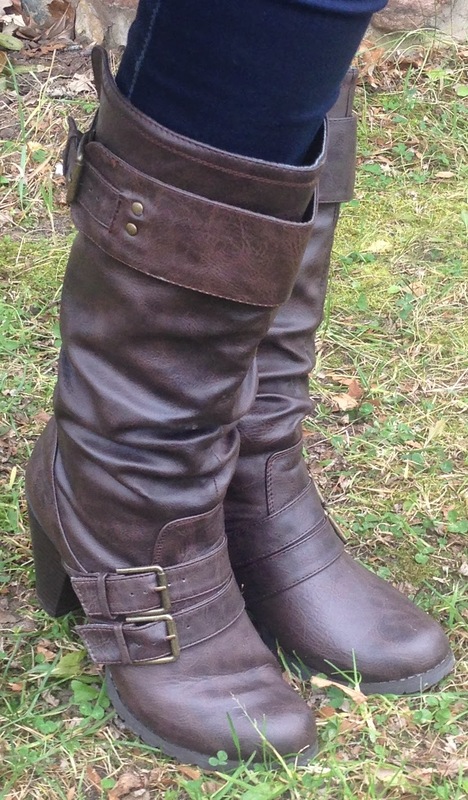 My tall brown boots I bought last year at Famous Footwear. I would love a pair of Cognac tall flat boots, but these have so little wear and tear (none actually) that I can't justify buying another pair. So what about you? Have the temperatures drastically dropped where you live so that you had to pull out those winter coats and boots yet? I hope not. I wish everyone warmer days! Your fashion posts really make me want to go shopping!! I don't really need a new coat, but I absolutely love yours! The warm boots you linked look very comfy too, and I definitely need some new warm winter boots. Me again Amy, do you happen to have a link to the coat from Macy's? I really love how it looks on you and would love to find a similar one. Sorry! I didn't include an on-line link to the coat, because I couldn't find it on-line. I bought it in the store, less than a week ago. That is such a great parka! Love the pretty grey shade and it look so cozy and warm!